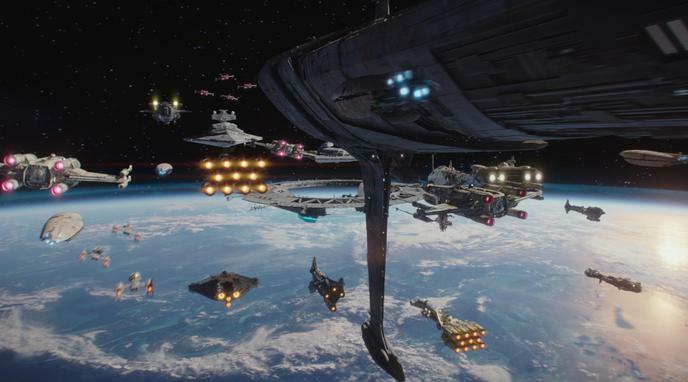 The Rebel Alliance would defeat the United Federation of Planets in space combat. over 4,000 light years per day. Combined with the Rebels' advantage in long range communication, this speed advantage means that in a single battle more rebel ships could join before the battle concludes. A speed difference of 1000 times is a strategic advantage that cannot be matched by the tactical advantage of having greater short-range speed and precision. If a fleet can move from one place to another in a minute and it takes the enemy 16 hours to follow them, then that fleet almost never has to engage in battle unless they are completely sure that they will win. Real space FTL (Faster Than Light): Star Wars uses hyperdrive, which is not real space FTL. Star Trek uses warp drive and can still interact with real space. The Picard manoeuvre is even based on this. As Star Wars cannot even come close to FTL in real space, it is doubtful they could track it, much less target or engage at it. Federation engineers would likely be able to quickly steal and reverse-engineer such tech thanks to their extremely advanced levels of research, manufacture, and the use of teleportation for espionage. As soon as a single ship with hyperspace capability was infiltrated, debilitated or captured intact enough for the Federation to work with; time would quickly run out for the Rebel Alliance. Depending on when in the Star Trek timeline the battle is placed, that isn't true. Voyager's maximum speed was stated at warp 9.75, which (very) roughly equates to 8x10^14 m/s, which is actually faster than the 4,000 light years per day here. Whilst this speed is clearly not something that happens a lot in the timeline, by the end of the 24th century one would be justified to imagine standard warp speeds reaching this sort of level. Technically, Federation ships can match SW ships in speed. The problem is that within the Star Trek universe, it's too risky to try. Re: ST: TNG episode "Where No One Has Gone Before," The 1701-D passed Warp 10 and ended up outside the boundaries of the universe itself (which was really not a good thing). So, whose universe are we fighting in, and with what rules? If were fighting in the Trek universe, those hyperspace advantages of SW vessels could prove to be a liability. Fast as the Rebels may be, their methods of propulsion face clear limitations that hamper their utility in battle and that the Federation does not have to deal with. Whilst Hyperdrive is substantially faster than warp, it has one major drawback, gravity wells, or interdiction. In Best of both worlds part II and scorpion part II it was shown that starfleet vessels could easily generate graviton beams from their main deflectors. As a graviton is a subatomic particle that transmits gravitational force, the federation could easily replicate the effects of Imperial Interdictors, essentially disabling Rebel hyperdrives. The Federation routinely fights at warp speed as the Picard Maneuver illustrates. Conversely, Rebel ships fight at sub-light speeds and can only enter hyperspace for extensively calculated "jumps". Federation ships could therefore easily attack Rebel ships while outrunning any Rebel plasma bolts or torpedoes sent in reply. This is true only in a strategic sense. The Rebel hyperdrive is faster than the Federation warp technology on a strategic level, but has fewer tactical applications.